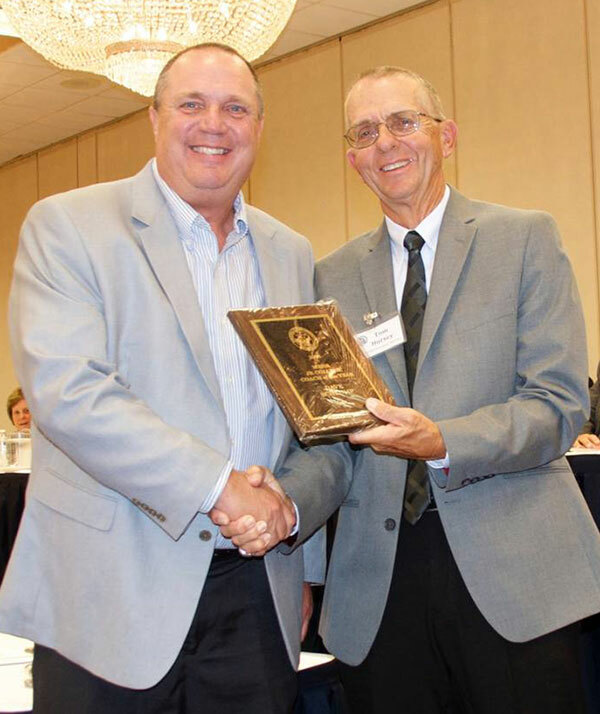 Tag Archive | "Coach Schlump"
Dave Schlump (left), of Cedar Springs, receiving the 2016 BCAM Men’s Junior College Coach of the Year award. The Basketball Coaches Association of Michigan (BCAM) recently named Dave Schlump, of Cedar Springs, as the 2016 BCAM Men’s Junior College Coach of the Year. The prestigious award comes after the Muskegon Community College (MCC) men’s basketball team, where Schlump serves as head coach, ended their 2015-16 season, with an overall record of 24-7 and a 2nd place finish in the MCC Athletic Association Western Conference. The MCC Jayhawks were ranked 8th in the nation in the National Junior College Athletic Association (NJAA) DII final poll, after starting the season unranked. They were the Region 12 District 9 tournament runner-up, losing a hard fought battle 87-90 to Lansing Community College in the finals. Four of Coach Schlump’s players earned All-Conference honors, with another being named to the All-Defensive Team. According to MCC, Schlump started his coaching career at Evart High School and Kent City High School. In 1991, he accepted the position of Varsity Basketball Coach at Cedar Springs High School (CSHS). Cedar Springs had suffered through a 30 game losing streak spanning over the two previous seasons. During his first season he, along with his coaching staff and the athletes, were immediately able to halt the losing streak. From there he began to build the foundation for a successful high school basketball program. At the conclusion of the 2003-2004 season, Schlump felt he was ready for the next challenge in his coaching career. He pursued an Assistant Coach position at Ferris State University (FSU), where he had previously earned his Bachelor’s Degree. While at FSU he helped the program achieve success in the GLIAC. During his time there, the Bulldogs won a Conference Championship and advanced to the Sweet 16 nationally. While at Ferris he gained valuable experience with the overall operation of a college basketball program. This experience includes recruiting and prospective player evaluations, along with day-to-day practice organization and individual skill development. Coach Schlump retired from Cedar Springs Public Schools, but still lives in the community with his wife of 30 years, Teresea. They have three children: Josh, Elyse, who is an assistant women’s basketball coach at Skidmore College in Saratoga Springs, NY, and Dan. When asked what this award means to Schlump, he humbly replied, “This means a lot coming from fellow coaches. It all stems from having great players and assistant coaches.” Currently, Jimmy Booth, a 2004 CSHS graduate, serves as both Schlump’s Assistant Coach and an Assistant Athletic Director.